These simply delicious chicken and dumplings have thousands of fans. The chicken stew takes help from a rotisserie chicken, but the dumplings are made from-scratch and practically fool-proof. I think chicken and dumplings might be my favorite comfort food dish. It’s most definitely my son’s favorite. He has requested these chicken and dumplings for his birthday dinner for the past few years, and I am always happy to make them for him. They are as simple as they are delicious because they start with a rotisserie chicken. I found the dumpling recipe here and thanks to reader comments used melted butter instead of oil and cooked them covered for 25 minutes. They turn out light and fluffy every time I make them. 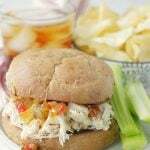 This recipe uses short-cuts (rotisserie chicken and canned soup) because I wanted to create an easy and quicker version of this classic comfort food. It isn’t an old-fashioned recipe for chicken and dumplings that starts with a whole chicken, but I do plan to create that type of recipe too. Purchase rotisserie chicken ahead if it’s on sale. Shred the chicken and place it in a freezer-safe zippered bag and freeze for up to one month. Then you’ll have chicken ready to go for whenever you want to make chicken and dumplings. Use a stock pot similar to this one to make your simply delicious chicken and dumplings. A glass lid helps to see the dumplings while they are cooking without having to remove the lid to peek. I use this cookie scoop to drop the dumplings into the pot. If you like this recipe, don’t miss my new recipe for Southwest Chicken and Dumplings HERE. These simply delicious chicken and dumplings have thousands of fans - this family-favorite dinner is my most popular recipe on Pinterest. The chicken stew takes help from a rotisserie chicken, but the dumplings are made from-scratch and practically fool-proof! In a large stock pot over medium heat, melt the two tablespoons of butter and add the carrots, celery, onion, parsley and all the seasonings, salt through pepper. Cook until the vegetables are starting to soften, about 5 - 8 minutes. Add the cream of onion soup, chicken stock and shredded rotisserie chicken. Stir well. Bring to a low boil and reduce heat to a gentle simmer. To make the dumplings, whisk together the flour, baking powder and salt. Whisk together the milk and melted butter. Pour the milk mixture into the flour mixture and stir together with a spatula until a smooth ball of dough forms. Using a 1.5 tablespoon capacity cookie scoop, drop the dumpling batter balls into the simmering stew one at a time until all the dough has been used. The dough should make 15 dumplings. Cover the pot and allow to cook (without uncovering) on a low simmer for 25 minutes. Shhhh, don’t tell! But I might just like this Southwest version a little bit better. Check out my latest chicken and dumplings recipe and tell me what you think! I love chicken and dumplings, and coincidentally, I found myself making it after Thanksgiving. I didn’t start with a whole chicken; I used turkey stock and chicken breasts. I’d love to try your dumpling recipe. They look fantastic. I guess when I say stalks, I’m thinking an individual stalk, not a whole bunch of celery. I’m sorry for the confusion. I have just always called one piece of celery a stalk, not a rib. I’ll add rib to the recipe list, as an alternate term. Made this last night. It was so tasty and easy. Thank you so much! I’m so glad you liked it Cindy. You’re welcome! Great question. I’ve switched recipe cards recently which encourages me to abbreviate the tbsp and tsp. I was always taught (I’m old) that a capital T is tablespoon and a lower case t is teaspoon. But I’m finding out that not everyone knows that 🙂 So t is teaspoon in my recipes and T is tablespoon. We must be of the same generation. That is exactly what I interpret t and T to be. I’m 45. Growing up that’s how I was taught! These look like a big warm hug from the inside! 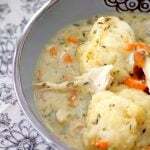 Chicken and Dumplings are definitely on the top of my comfort food list as well! can you use just milk or does it have to be buttermilk? They will not taste the same if you use milk. The texture will be different too. Absolutely delicious! We loved it for dinner and the little amount we had left over was great reheated for lunch. This will be made again and again!! Awesome to hear. Thanks so much for the positive feedback, I really appreciate it! Love, love, love chicken and dumplings!! This recipe looks amazing — totally craving it right now! This looks like the perfect comfort food! I’m so excited about finding this recipe! It will now be one of my “go to” recipes! Thanks so much for sharing! Hi! So excited to try this its cooking now… the dumplings don’t seem done after just 25 minutes they’re still doughy any suggestions? Mine always look doughy on the outside but when cut into they are definitely cooked through. If it was simmering the whole 25 minutes they should be good. Can you refrigerate and warm left overs? Making this for dinner tonight but had one question. What size cream of onion soup? Do I need to make a thickening agent? No. It thickens on its own. You say use cream of onion, chicken, or celery. Which one is the best and why? Made this tonight… was sooo delicious. Everything I wanted out of chicken and dumplings! I did add some frozen peas, because I love them so much. Thank you for the delicious yet simple recipe. Already have requests to make it again. Wonderful! Thank you so much for taking the time to add your positive feedback – it’s greatly appreciated! I made this one Saturday for dinner, and made a few changes to make it dairy free. Almond milk for the milk, vegan butter for the melted butter, and skipped the cream of soup and it still turned out great! I am making again for dinner tonight and will probably a tablespoon of crushed red pepper to add some heat. I’m so glad to hear that the dairy-free substitutes did not affect the final dish. Thanks for the positive feedback! Excellent question and I have edited the recipe instructions to reflect it. The first two tablespoons go into the pot to be melted as the onions, carrots, celery and parsley are being cooked. Then the remaining FOUR tablespoons of butter are stirred into the dumpling batter. The butter amounts are correct in the ingredient list but it was not clear in the instructions so I have corrected it. Thank you! I hope you enjoy this dish. I really must have a go at making those dumplings. Oh and I am loving that bowl. You really should try these! Whenever my children are unwell or have been out at sport all day in winter. This is the dish they request. So good with plenty of ‘feel good; factor.. I see chicken and dumplings pop up from time to time on the web and always think I must get round to that and for some odd reason I never do. This looks glorious. I really must give it a try! You really should try these Brian – it’s a family and reader favorite. I love chicken and dumplings and you make them just like my Mom and grandmother do — which is to say – the right way. Have you seen those “northern dumplings” that are nothing more than a noodle? I was like, what??? This looks perfect! Can you freeze the chicken and dumplings? Going out of town and trying to find dinners I can freeze!!! This looks SO delicious!!! I haven’t tried freezing them. But I think you could. I’m wondering if the texture of the dumplings would change much after thawing? Let me know if you try freezing this recipe! Yum! Made this tonight and it was so good! I’ve tried other recipes using the canned biscuit and it turned out so gross. Decided to try it this way and it’s worth the extra work. And it wasn’t even that hard! Everyone loved it! Made tonight for family. It was delicious! They whole family enjoyed and it was pretty easy recipe. Thank you! I had a craving for chicken and dumplings today and although I’ve never made them before, they turned out great! My husband loved them, too! This recipe is a keeper! I’m so happy to hear this Mandy. Thanks for taking the time to come back and comment! Oh, chicken and dumplings is an ultimate comfort food in my house. Family favorite favorite and absolutely delicious! What a hearty, warming dinner – perefect now that the nights are getting colder! Yes, chicken and dumplings are the ultimate comfort food! I was just telling me son that I needed to make him chicken and dumplings! I can’t believe he’s 11 and I’ve never made it as it was one of my favorites growing up – pinning this for SOON! So happy to hear this. Thank you for the Pin and come back to let me know what you both think! This brings back childhood memories! My mom made chicken and dumplings often! Looks like amazing comfort food! Thank you for this post!!! You’re welcome. I hope you try this version and let me know what you think! 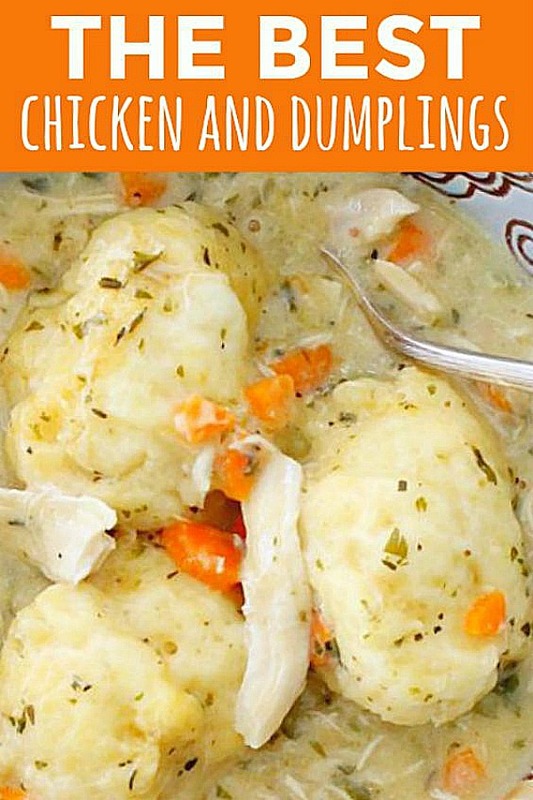 Chicken and dumplings is my ultimate comfort food, this version looks fantastic! It really is. One of our all-time favorite family dinners. Thanks Amy! I have been making the same recipe for chicken and dumplings forever. I decided to try your recipe because I didn’t have to cook the chicken first. It was much simplier starting with a rotisserie chicken. My husband loved it, but I liked it better the second day. The only change I made was to use the red lobster cheddar bay biscuits recipe for the dumplings. Oh wow. The cheddar bay biscuit recipe would be an amazing addition. So you used that recipe and they cooked up well as dumplings? That is great to know. I will have to try it! I used the box mix and had to cook them about 5 minutes longer. Your recipe was the first time I tried it. I wish it was my idea, but I saw it on Pinterest. It worked! 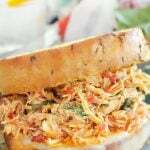 Thank you for sharing this amazing and easy to follow recipe it’s now a staple in my family. I’m very happy to hear this Matt. Thanks for the positive review and rating! Thanks for the recipe. This is a 5 star. I found it in August and I have made it several times. Never have I made better dumplings. Love this review. So happy that you enjoy my recipe for chicken and dumplings. Thanks very much Pam! Made this tonight for dinner. The only addition was some half and half for a creamier soup. I also used a 1/2 tablespoon to make smaller dumplings. My husband and son loved it as well. Thanks for the recipe! This was delicious! I put in 2 tsp of pepper to give it a bit more kick and we all just loved it. I’ve been looking for the perfect recipe for chicken ‘n dumplings and this is it! Love it. Thanks for the rating and comment! I love the idea of using rotisserie chicken for this chicken and dumplings! Sounds delicious!! Those shortcuts are PERFECT for busy weeknights – thank you! This looks incredible! Can’t wait to try this. Thank you Andrea. Come back and let us know what you think! This is the perfect dinner for a cold winter’s day! My entire family loved it! So happy to hear this Sabrina. Thank you! You read my mind! I was just thinking of chicken and dumplings and wondered how they could be made easier. Thanks so much! I am not a cook by any means and this recipe was simple, hearty and delicious. I used bourbon smoked paprika too for a little flare. A great soup for sure and we ate every last drop! I’ve got to find some of that bourbon smoked paprika 🙂 Thanks so much for the positive rating Sam! You’re welcome. I hope you try it! Great short cut! Love hearing how readers make my recipes their own. Thank you for the comment. 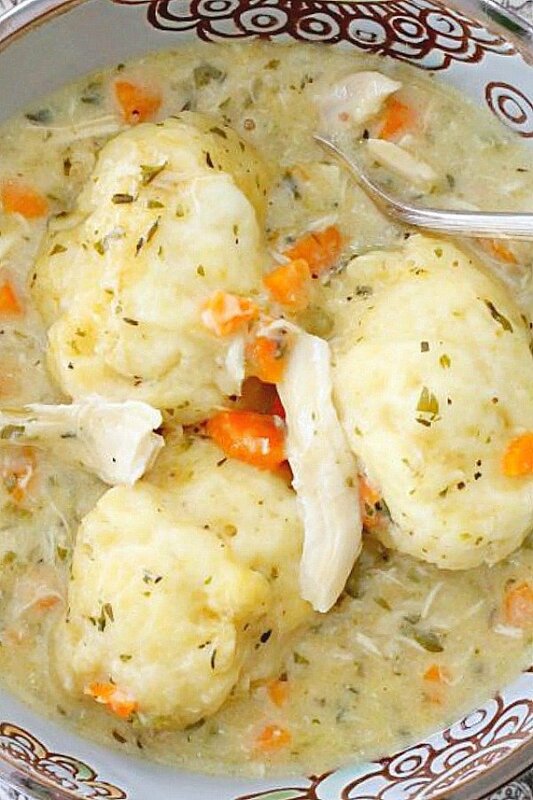 Chicken and dumplings is such a deliciously comforting meal. This looks sooo good! It is perfect comfort food. Thanks Bintu! You just got your self yet another fan of this recipe. Oh wow does it look delicious and SO comforting. I want a serving right this minute! I really appreciate that Valentina, thank you! 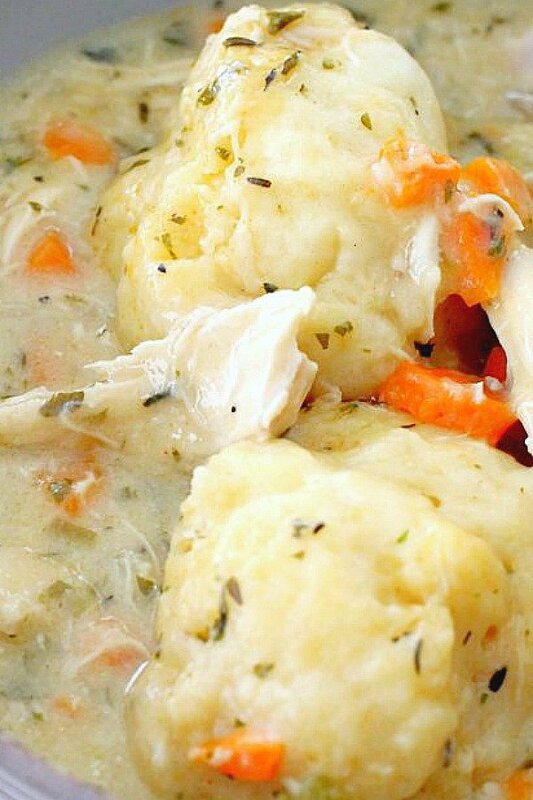 There really is nothing more comforting that chicken and dumplings! Wonderful to hear. Thank you for the rating and positive comment! Hi, can I just use white chicken breasts instead of chicken with bone in? Thx! I start with precooked chicken. I haven’t tried this particular recipe with raw chicken. But if you mean you are adding cooked chicken breasts in the step that calls for adding the shredded rotisserie chicken then yes, you can use chicken breast. I made this recipe for dinner last night and I wanted to tell you it was delicious. 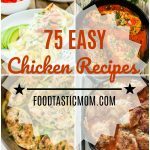 I have been using other recipes in the past that were far more complicated. This one was so easy and it turned out great. Thanks for sharing. I’m so glad that you enjoyed this recipe. Thanks for taking the time to share your positive experience! Does the recipe call for milk or buttermilk? Jill, it looks perfect and tasty! Can’t wait to have this anytime of the day, love it! 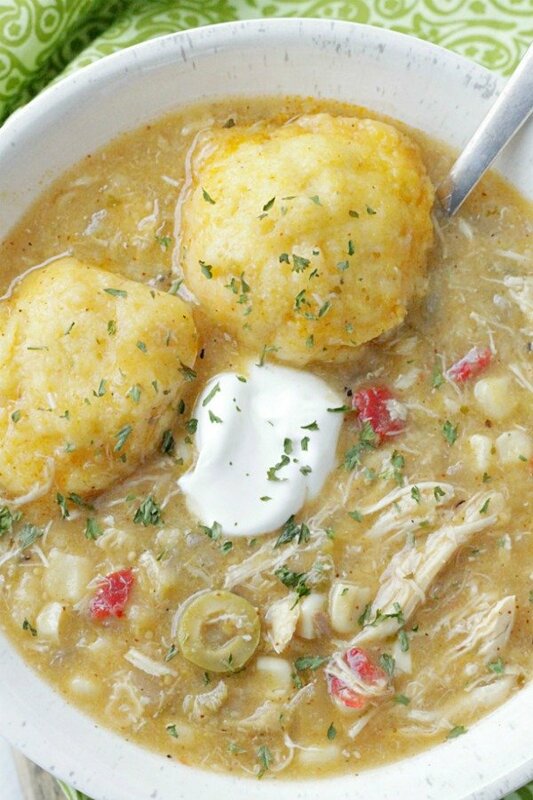 A perfect combination of chicken and dumplings. This dish is perfect for the cold weather here in our city. Will definitely cook this one for tomorrows dinner.